I love fairy floss. That’s what we call it here in Australia. For my American readers, you’ll know this fluffy, sugary treat as cotton candy, and in Japan it’s called wata-ame (わたあめ) or wata-gashi (綿菓子), both of which also mean cotton candy. 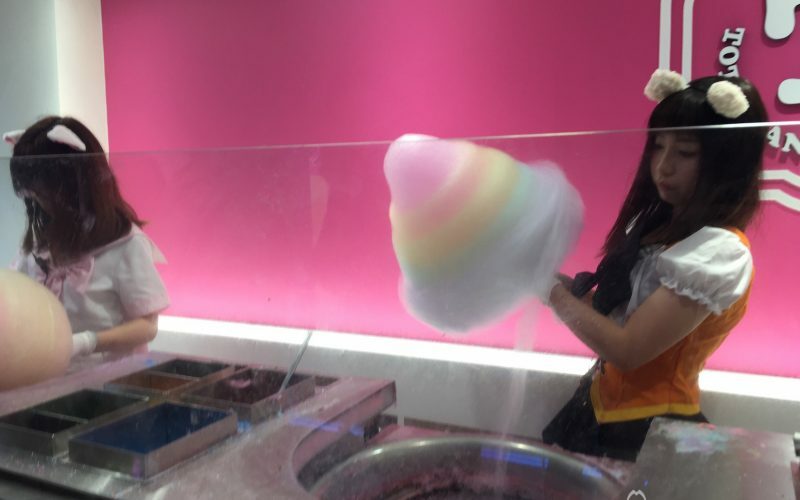 When I realised that huge, rainbow fairy floss was readily available in Tokyo’s iconic suburb of Harajuku, I had to try it. 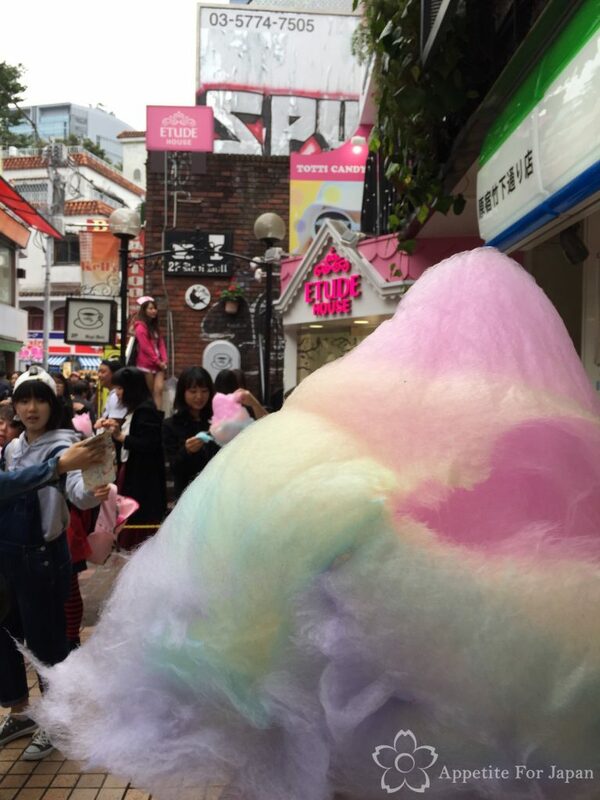 Harajuku is famous for its youth culture and over-the-top fashion, and I can’t imagine a more perfect place to find (and devour) giant, rainbow cotton candy than Harajuku! Totti Candy Factory (トッティキャンディファクトリー) has four stores altogether, two of which are in Osaka, and the other in Nagoya. They all sell giant, colourful cotton candy. However, the only store that sells the giant rainbow version is Harajuku. 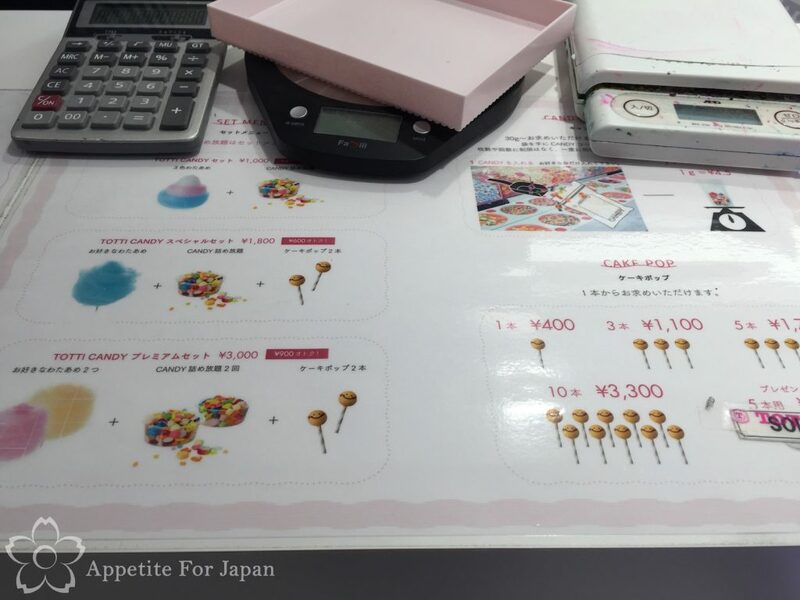 While Totti Candy Factory is most famous for its cotton candy, it also sells kawaii candy (cute lollies) and cake pops. 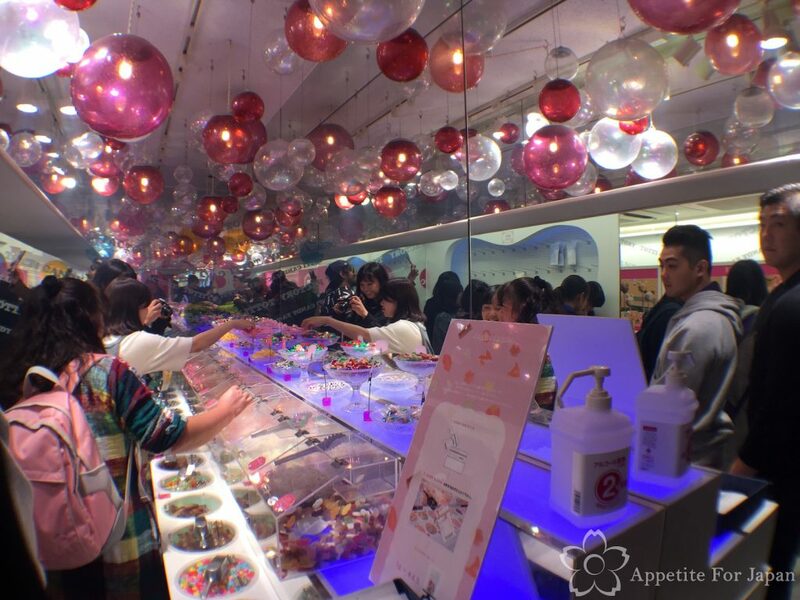 Harajuku is always crowded, and there is always a queue at Totti Candy Factory, so they have wisely placed the pick’n’mix lollies so that you have to slowly make your way past them before you can get to the counter to order your fairy floss. 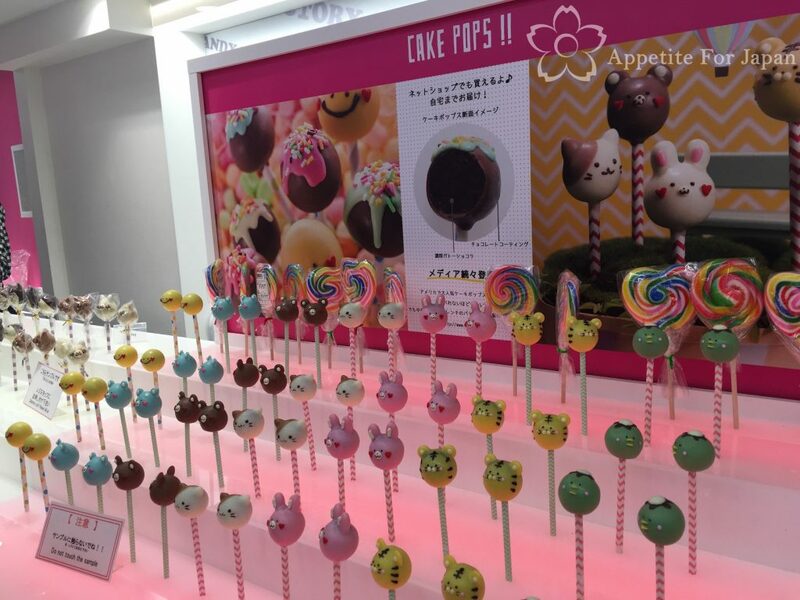 You’ll also wander past the displays of fake food – super kawaii fake pops inspired by different animals, which you can also order once you reach the counter. 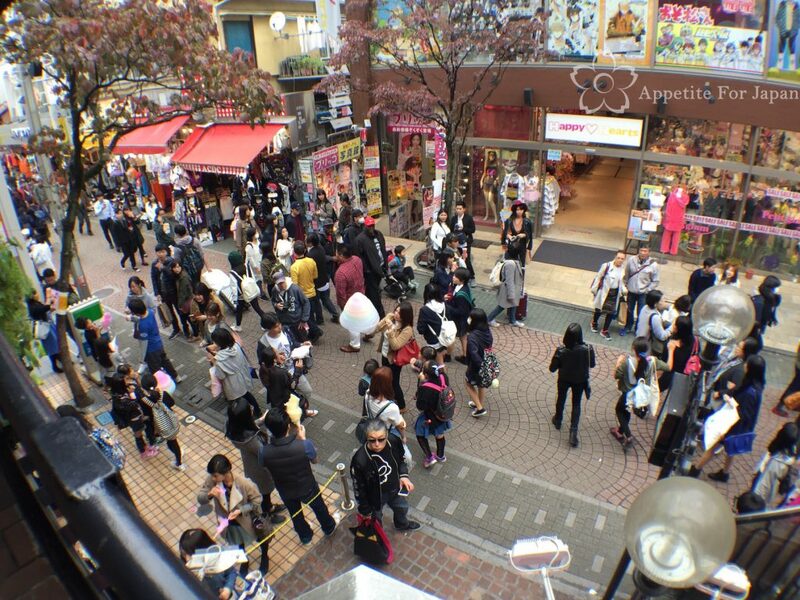 We visited on a weekday because we find Harajuku a bit too crowded on the weekend. 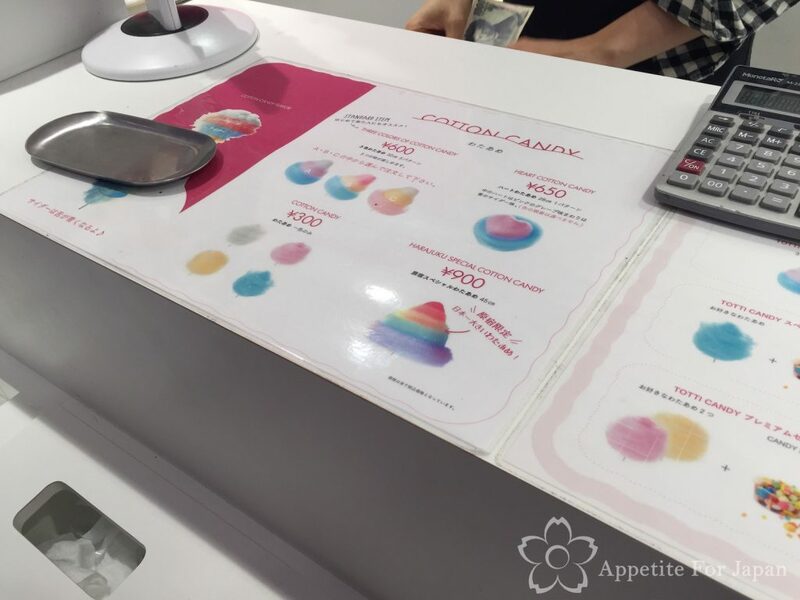 Nonetheless, it took about 15 minutes to reach the counter where we could order our giant cotton candy. 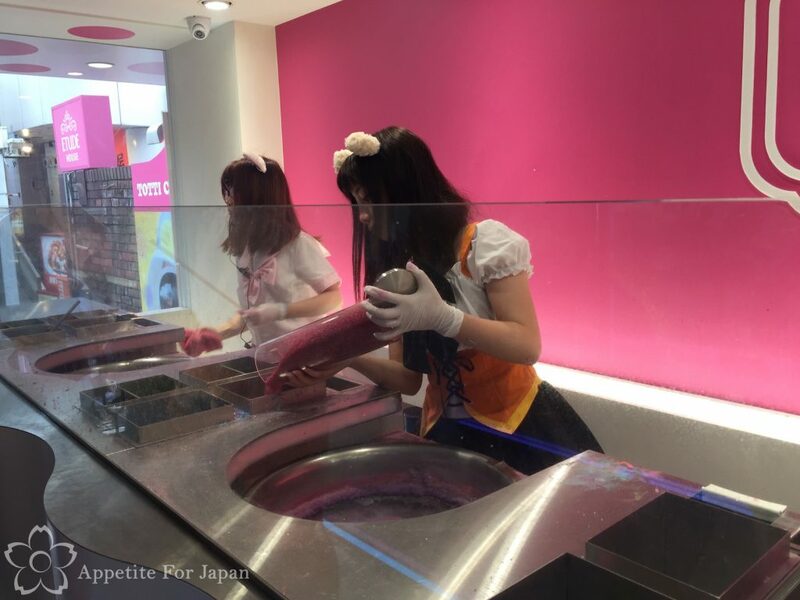 Two girls in maid costumes and cat ears make the cotton candy as you watch. For the rainbow versions, they pour in the different colours one by one. It’s quite cool to watch. Above: And here it is! If you’ve eaten as much fairy floss as I have, you’ll know that you need to eat it as quickly as you can once it has been made – especially if it’s the freshly spun variety. Head down the steps as quickly (and carefully!) as you can, and stand outside the FamilyMart convenience store where you’ll see the other people eating theirs. 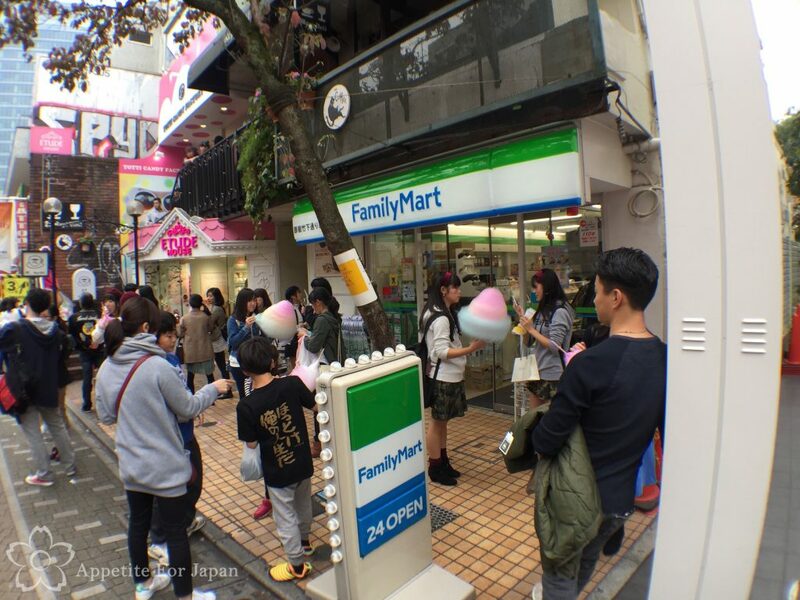 The reason that everyone stands outside the FamilyMart is that it’s considered rude to eat whilst walking in Japan. 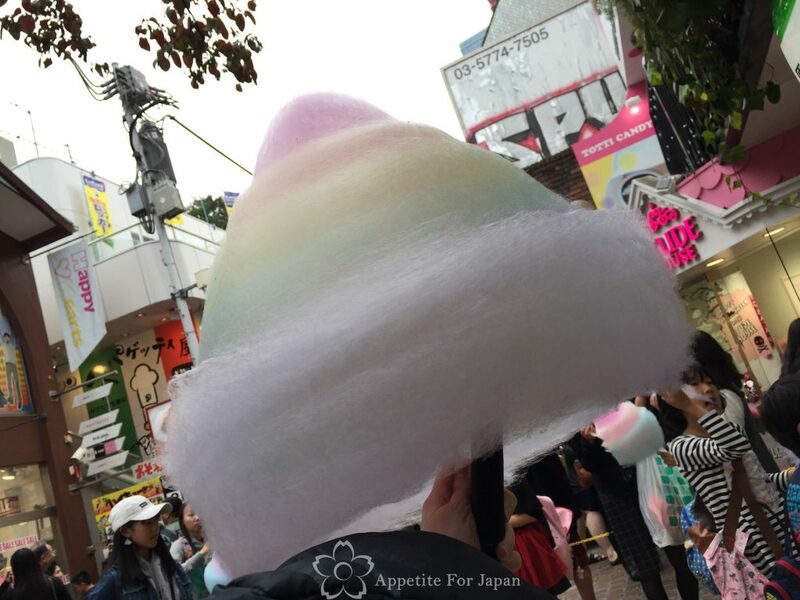 That, and try eating cotton candy bigger than your head whilst manoeuvring through the crowds of Harajuku’s always-busy Takeshita Dori! Don’t feel bad about standing in front of the convenience store – it’s actually expected that this is where you’ll stand while you eat it. Once you’ve finished, go back to the steps that lead up to Totti Candy Factory and place your stick in the bin provided (when we were there, they had a girl dedicated to crowd control and throwing out the used cotton candy sticks). I took a couple of photos of the menu at the counter, which give an indication of the prices. 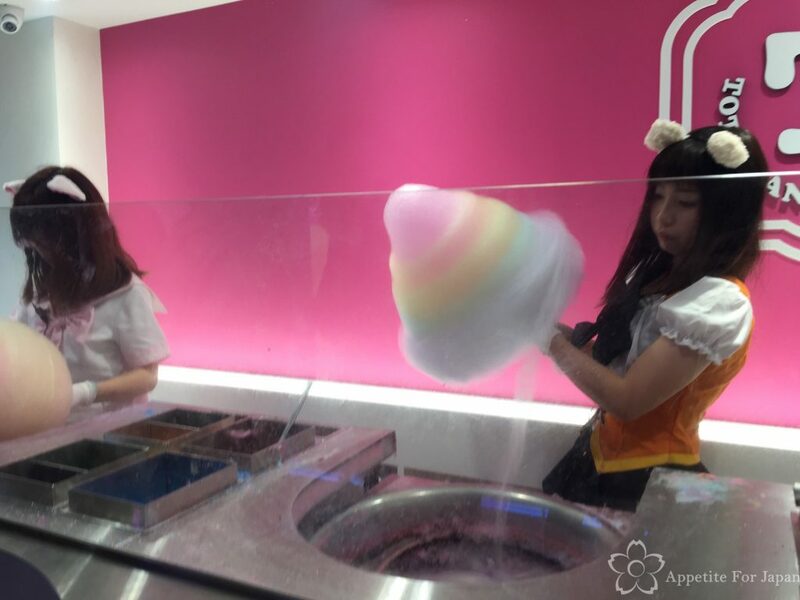 Totti Candy Factory is not cheap, but… how can you resist giant, rainbow cotton candy? The enormous rainbow one is called ‘Harajuku Special Cotton Candy’ (because it’s exclusive to the Harajuku store), and it costs 900 Yen. You can get smaller versions from 300 Yen to 650 Yen. Cake pops are also expensive at 400 each (although they become a little cheaper if you buy a larger quantity). You can also get combinations of cotton candy, lollies and cake pops. Would I recommend Totti Candy Factory? If you like cotton candy/fairy floss, then yes! Definitely! Like I said, this is the best fairy floss I’ve ever had. I will definitely be going back there (don’t tell my dentist!). Totti Candy Factory is easy to find. Exit Harajuku Station, cross the road and head straight into Takeshita Dori (Takeshita Street). Totti Candy Factory is about halfway down the street, on your right. 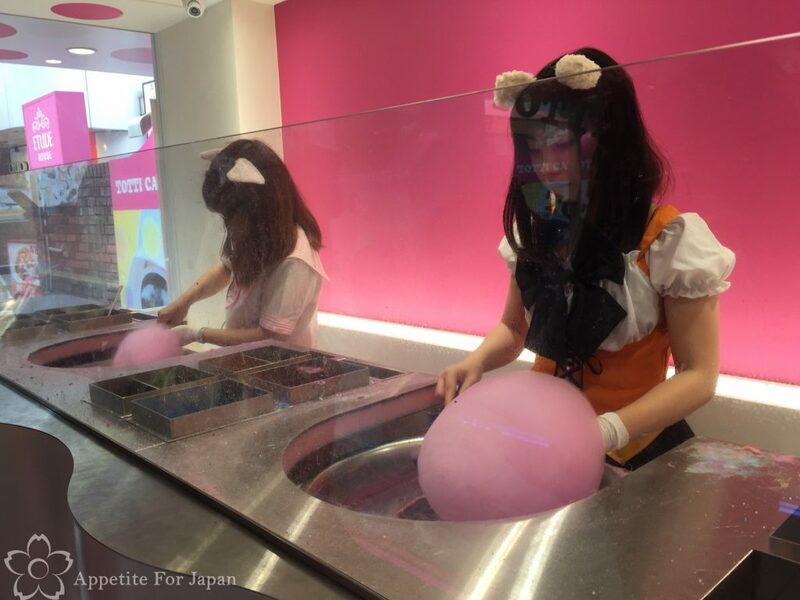 Keep an eye out for people standing around eating giant cotton candy, and you’ll know you’re close. 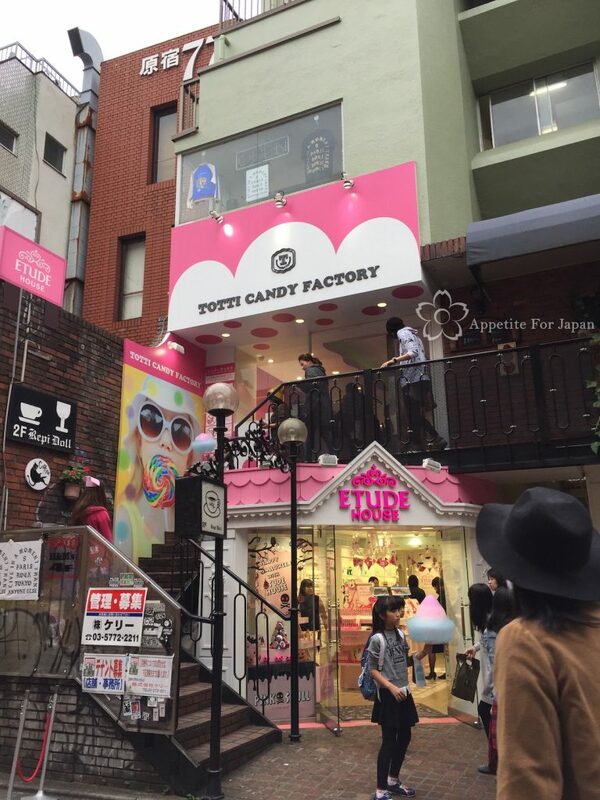 It’s pink and white and just above Etude House (which is also painted pink and white).